Africa was a big beneficiary at the just concluded climate change talks in Katowice, Poland, getting strong financial commitments to help it push its climate change agenda. The talks, which came to a close late Saturday after a three-day standoff pitting delegates from the industrialised and developed nations against those of developing nations, which make up the majority of the “rulebook” by which the Paris Agreement can be implemented by all countries. “All nations have worked tirelessly. All have shown their commitment. All nations can leave Katowice with a sense of pride, knowing that their efforts have paid off. 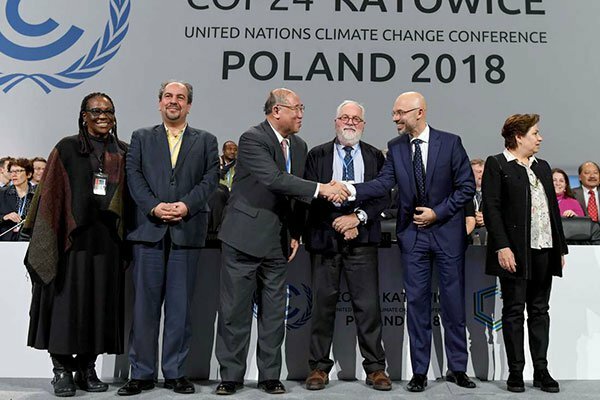 The guidelines contained in the Katowice Climate Package provide the basis for implementing the agreement as of 2020,” said Michal Kurtyka, the president of the 24th Conference of the Parties to the United Nations Framework Convention on Climate Change, also known as the Katowice Climate Change Conference (COP24). The Katowice Package is a new set of climate change guidelines and rulebook to accelerate national action plans. It also sets out how countries will provide information about their nationally determined contributions (NDCs) that describe their domestic climate actions, including mitigation and adaptation measures as well as details of financial support for climate action in developing countries, which is a big win for Africa. Kenya’s Environment Cabinet Secretary Keriako Tobiko said the negotiators had finally managed to reach what he described as a “robust” set of implementing guidelines for the landmark 2015 Paris Agreement. “Following a round of three sleepless nights, the COP 24 talks came to a close with a number of compromise arrangements for the earlier contentious issues. “The Africa Group of Negotiators has been burning the midnight oil seeking to advance our unique interests and we have made significant headway with the adoption of the Katowice Package,” Mr Tobiko said. Kenya had led African countries in pushing for access to predictable and adequate funding options, as a key challenge frustrating the implementation of climate change action plans in developing countries. “Access to new, additional, predictable and adequate climate finance is critical for developing country Parties to implement their priority adaptation and mitigation actions and meet their obligations under the convention and the Paris Agreement,” Mr Tobiko said. On the financing to support climate action in developing countries, the Katowice Package charts the way to decide on new, more ambitious targets from 2025 onwards, from the current commitment to mobilise $100 billion per year as from 2020. UN climate chief Patricia Espinosa said that arriving at a consensus after the 30-hour standoff was an excellent achievement, which had seen the multilateral system deliver a solid result. “This is a roadmap for the international community to decisively address climate change. The guidelines that delegations have been working on are balanced and reflect how responsibilities are distributed among the nations. “They incorporate the fact that countries have different capabilities and economic and social realities at home,” Ms Espinosa said. For Africa, another win was several financial commitments that saw Germany and Norway announce expanded commitments for climate action, both, pledging to double their contributions to the Green Climate Fund. The World Bank also announced it would increase its commitment to climate action after 2021 to $200 billion; the UN Climate Adaptation Fund received a total of $129 million. The Katowice Package also features a detailed, transparency framework to promote trust among nations that they are all doing their part in addressing climate change. It sets out how countries will provide information about their national action plans, including the reduction of greenhouse gas emissions, as well as mitigation and adaptation measures.